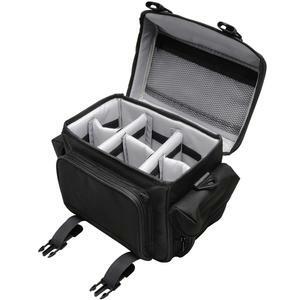 This Precision Design 1500 Deluxe SLR System Carrying Case is designed to easily accommodate your digital SLR camera, lenses, flash, and numerous accessories including batteries, memory cards, filters and much more. Made from durable nylon, and outfitted with a reinforced handle, this case will keep your equipment well-protected from light impacts and scratches, while providing ample storage. 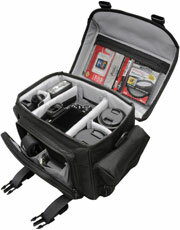 Travel is made easier and more comfortable with the adjustable shoulder strap. 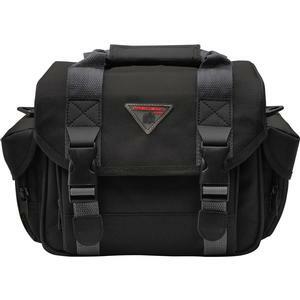 The many zippered and hook-and-loop-closure pockets hold all your supplies. Two large zippered mesh pockets -- one on the inside of the top flap and an additional one on the inside of the zippered interior flap -- allow easy access to filters, memory cards or batteries. A large zippered compartment on the front of the bag contains sewn pockets that safely protect pens, cleaning supplies, and lens caps. Two side pockets with hook-and-loop/zippered closure provide instant access to your most essential accessories. The best feature however is its large interior (9.5 x 6.3 x 6 in.) 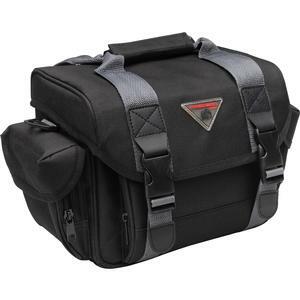 padded storage and compartment space. Removable hook-and-loop dividers provide individual customization to your equipment. 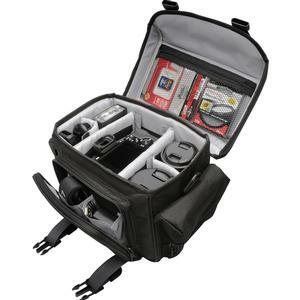 Whether you use this case for your DSLR or mirrorless ILC camera, the Precision Design 1500 Deluxe SLR System Carrying Case will hold all of your most essential accessories.